Let me be blunt. You are running out of time! If you want to discover how your SME clients can raise capital without throwing themselves at the mercy of the banks, and, how your accountancy firm can profit substantially from new revenue streams... then yes, you really are running out of time. Because, we at ESS BIZTOOLS, are offering a 40% discount on all the information, strategies and documentation you are going to need to fully understand and work with Crowd Sourced Funding Equity Raising. But, like magic, that discount will disappear in a puff of smoke when the clock strikes midnight on Friday 15th February 2019. Is it just another scheme? This new form of capital raising is poised to become one of the most exciting developments to hit Australia's small and medium sized business sector in more than a generation. I believe it's nothing short of revolutionary! You shouldn't look on it suspiciously as something new or a flash in the pan. It's here to stay. Crowd Sourced Funding Equity Raising (Click here) has been working successfully in the United States, Canada, the United Kingdom, and more recently, New Zealand during the past decade. There are literally thousands of success stories, and it's been giving Venture Capital a run for its money as the preferred option for SME capital-raising. Finally, on 19 October 2018, Crowd Sourced Funding Equity Raising, became legal here in Australia for small proprietary companies. Some SMEs have already been funded! Within just three months, a number of ASIC appointed Intermediaries (BAS5026) reported having successfully raised capital for more than a dozen small and medium sized businesses, and more offerings are coming on-line all the time. 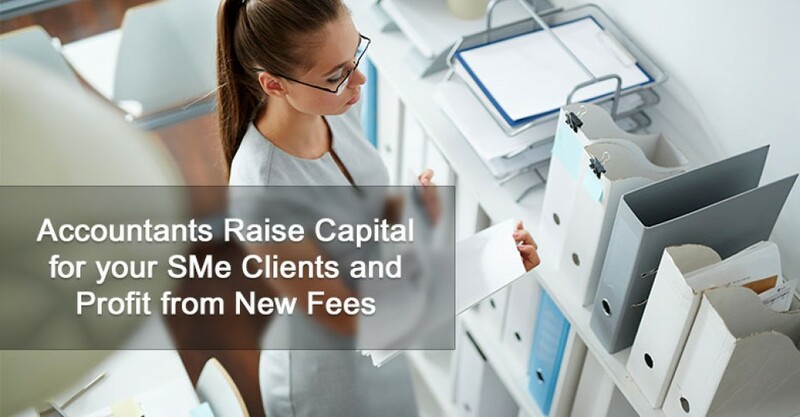 Each of those SMEs that raised capital had to involve their accountants in the capital raising process, and most SMEs are the clients of small sized accounting firms. So, what does that mean for your accountancy practice? You may even find yourself working with your clients as their Virtual Chief Financial Officer. Performing each of these necessary functions will attract premium fees for your practice (Click here), well in excess of those you can currently charge for tax compliance work. In fact, it's been estimated that accountancy fees for a standard equity-raise (Click here) under Crowd Sourced Funding will be around $40,000. You're right. If it was that easy, everyone would do it. To attract those sorts of fees, you'll have to become an expert in the field. My company, ESS BIZTOOLS, can help you there. We've spent twelve months researching all aspects of Crowd Sourced Funding Equity Raising and we've put the results of that research together as an information kit, then we've combined it as a Product Package (Click here), with all the pro-forma documents you'll need to get your clients ready for the Intermediary to take to their pool of private investors (Click here). Most Intermediaries claimed to have around 30,000 private investors on their books. Having all the information you'll need available in one package will save you many hours of valuable time, by getting up to speed efficiently on this newly-legalised capital-raising platform. Don't let the clock run out on you! Get our comprehensive Crowd Sourced Funding Equity Raising Product Package now and save 40% before 15 February 2019, simply by going to our website www.essbiztools.com.au and using the discount code "CSFC40". Alternatively, you could subscribe to our ESS BIZTOOLS' Gold Package, which gives you access to all our business tools, and we're also offering 40% discount until 15 February 2019. Full details of the Gold Package (Click here) are available on our website. Use the codes GOLDY40 to subscribe to our discounted upfront fees for the year, or GOLDM40 if you'd prefer to pay by the month. Do you have concerns spending on-line for a product you haven't seen yet? You're thinking "the product is intriguing. It's something I'd like to get to know about" but, deep down you have that nagging feeling that the Product Package might not turn out to be everything you'd hoped it would be. Am I right? Don’t worry … at ESS BIZTOOLS all our products are covered by our No Risk Money Back Guarantee. (If, after 60 days, you are not completely satisfied with ESS BIZTOOLS, we will gladly refund your subscription). However, that deadline of 15 February 2019 is fast approaching. Don't miss the Discount. You'll kick yourself if you do! The normal price for the Crowd Sourced Funding Equity Raising Product Package is $999 (incl GST) and our Gold Package is $2,970 (incl GST). Subscribe now .... and enjoy a 40% saving both these packages up until 15 February 2019. You'll find this is incredible value for money. Crowd Sourced Funding Equity Raising is a new solution for your SME client, who need to do business in the 21st Century.